They say it started more than 500 years ago, when on Shrove Tuesday (the day before the start of Lent), a housewife in England was cooking at her stove, heard the bell for church, and dashed from her house to the church still wearing her apron and carrying her skillet. 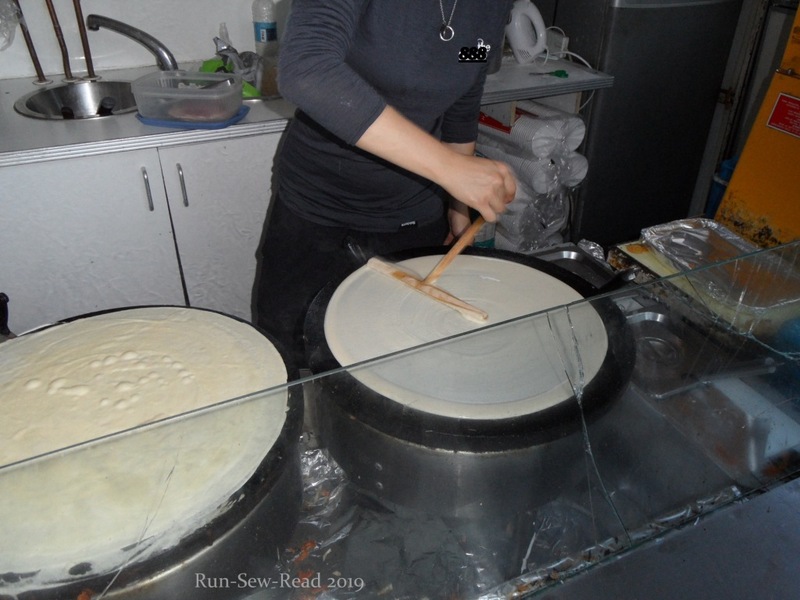 Today it is an annual international women’s race, in which the participants wear a housedress, headscarf and apron, and must carry a skillet with a pancake in it, and flip the pancake. The event takes place in Olney, England and Liberal, Kansas USA. Each town holds a race, and the fastest finish time wins the international contest. A multi-day festival has grown up around the event. 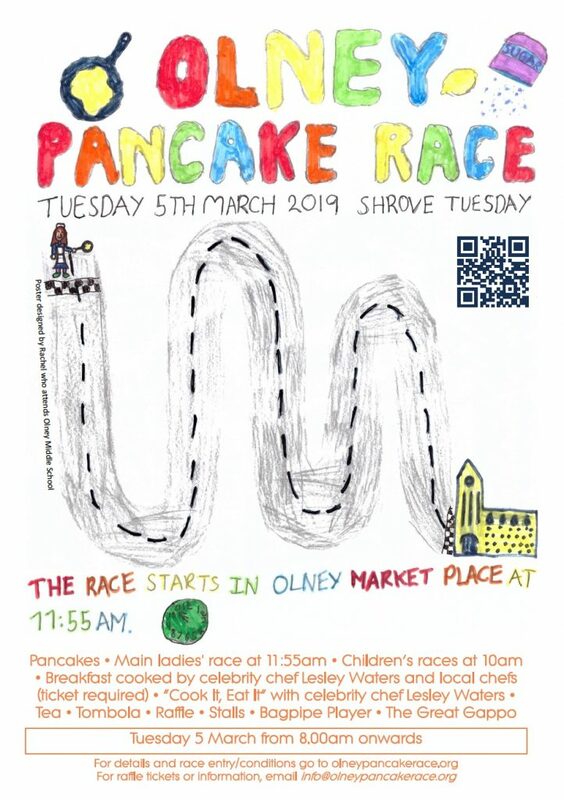 Each town maintains a Pancake Day website; and each maintains a Facebook page, which is great for enthusiasts like me who want real-time updates on race day. 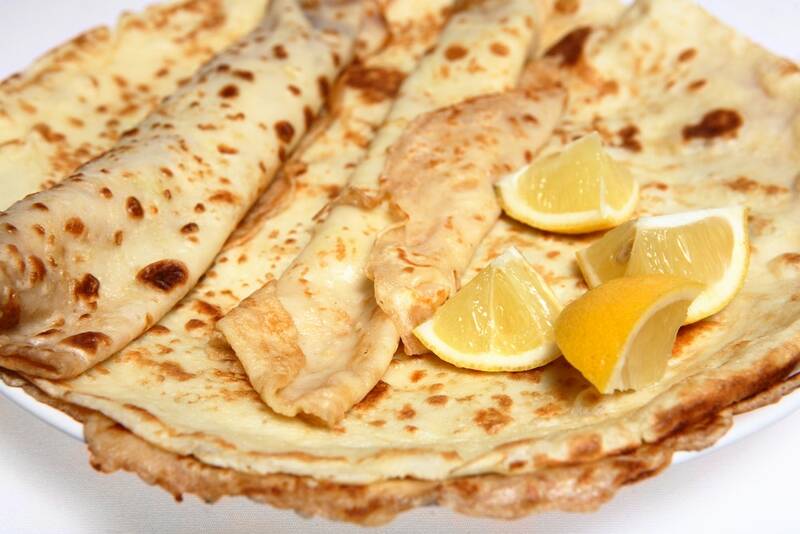 Each of the two cities’ websites gives a brief history of the Pancake Day Race. Since each site provides a fact or two that the other one doesn’t, I’ve included both. But hey, the best thing to do is visit both websites for more history and photos of past events. 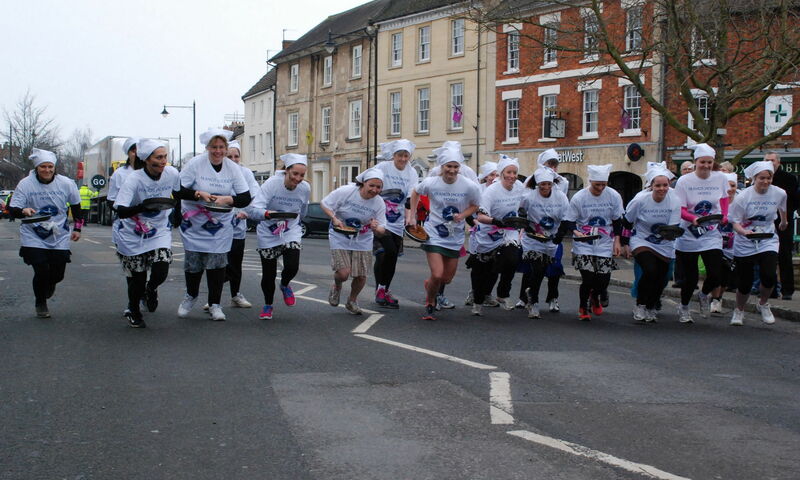 “No one is quite certain how the world famous Pancake Race at Olney originated. One story tells of a harassed housewife, hearing the shriving bell, dashing to the Church still clutching her frying pan containing a pancake. Another tells that the gift of pancakes may have been a bribe to the Ringer, or Sexton that he might ring the bell sooner; for ringing the bell signalled the beginning of the day’s holiday and enjoyment, no less than to summon the people to the service at which they would be shriven of their sins before the long Lenten feast. “Tradition declares that the race was first run in the year 1445, pancakes at the time being a popular dish, receiving royal favour. It was run on Shrove Tuesday, the day before Lent, and the whole day was given over to a festival of celebration, pranks and pastimes. It is not known where the original start line was but the finish line was at the Church door. “The race continued through the centuries, and whilst many other local customs died, and the race itself may have lapsed many times, such lapses never caused the race to be entirely forgotten by the womenfolk of Olney. It is known to have taken place during the troublesome times of The War of the Roses (1445 to 1487). “After a lapse during the Second World War, it was revived again in 1948 by the Vicar of Olney the Reverend Canon Ronald Collins. In clearing out a cupboard he came across some old photographs, which had obviously been taken in the Nineteen Twenties and Thirties of women running with frying pans. Filled with enthusiasm to revive the ancient custom, he called for volunteers, and in response thirteen runners appeared on Shrove Tuesday that year. The race immediately caught the popular imagination and people of Olney set out to enjoy this simple and colourful link with their rich past, a day of festivities. At 11:55 am Olney time (5:55am Central US time), the Olney Race begins. At 11:55 am Liberal time (5:55pm Olney UK time), the Liberal race begins. Olney: Partly cloudy and 50°F with a SW wind of 17 mph, causing a feels-like temp of 45°F. Attending these two Pancake Day races is a bucket list item for me. It’s only a 3.5 hour drive for me to Liberal, KS, but Tuesdays pose a problem. Once again this year, work has intervened to keep me from going. Next year, Pancake Day is on Tuesday, February 25. I shall try again. 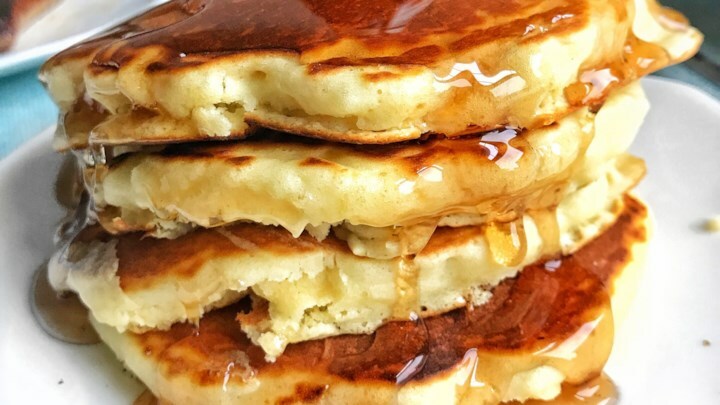 American pancakes are typically thicker than English pancakes. I love both. 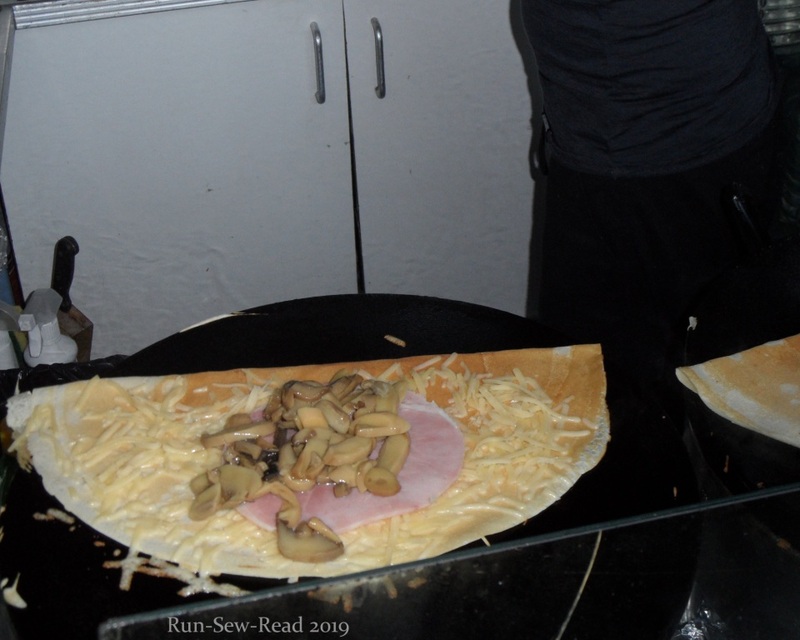 I love pancakes so much that on my first ever trip to England (in 2010), I took a picture of my first-ever English pancake, and the lovely, skilled vendor cook who made it for me. After an excruciatingly long wait, Season 5 premiered this month! Here is the entire hour-long Episode 1 of Season 5 on Youtube. My advice is to watch it now, because like other GBSB episodes, this quality upload will likely disappear soon from Youtube. Which also means, parts of this post will disappear. The sewing contestants who have appeared on the GBSB are from a wide variety of backgrounds and ages. Many are self-taught. Some of the older participants have spent their lives sewing for themselves and their children. While I’d love to have the show’s workshop and haberdashery, I would be crippled by the time pressures! How do they do it with a show host yelling at them that they are almost out of time??? As the screenshots below indicate, the contestants design and produce amazing garments in just 2 or 3 hours; sometimes less time than that. What happens to the contestants? After their stint on the show, my impression is that most of the contestants go back to their regular lives. But at least one, Tilly Walnes, has parlayed her skill and participation on the show into a successful business. She has an inspiring website for beginners and experts alike. The patterns Tilly has designed for sale in her shop are great. I purchased her “Coco” dress pattern, and now [almost] three Coco dresses later, I’ve purchased three more of her patterns. Hopefully the new patterns will all soon become fun garments in my closet. When to watch: The GBSB episodes are broadcast weekly on BBC, on Tuesdays at 9pm UK time, which is 3pm Central time in the US. Soon after that, start checking Youtube for an uploaded episode. It may take a few hours, or days before one appears. Warning: Choose carefully among the Youtube offerings, and by that I mean steer clear of the dodgy videos that require you to click a link outside of Youtube to watch the episode. We really need to be able to watch The Great British Sewing Bee on TV in the US! I’ve inquired with our local PBS station, and they made inquiries, and were told succinctly that it is not available in the US and may never be available here. Commence temper tantrum. UPDATE! Here is Season 5 Episode 3, aired Tuesday, February 26, 2019. They are doing vintage 60s-70s garments, using vintage machines and playing great background music from the period. There’s my sewing machine! This 2017 documentary shows Andy Warhol, Mick and Bianca Jagger, Truman Capote, Lee Radziwill, photographer Peter Beard, and others, enjoying themselves at an ocean-front home in Montauk, and at Lee’s Aunt Edie’s house in East Hampton. Beard is the main narrator. Some of the surviving participants and their contemporaries gave interviews for the documentary. There are no put-ons in the vintage film footage. No one is on stage or playing to an audience. The footage is akin to home movies of a group of friends having fun away from the city, taking pictures, and indulging their creative propensities. That is, except for Lee’s part in helping to bring her aunt’s house up to code. That part gave the impression of being professionally filmed, but was no less interesting. If you have seen the 1975 documentary, Grey Gardens, then you know of Edie and the house, and that the two ladies who lived there are famous. If you haven’t seen the original Grey Gardens, that is the place to start. Grey Gardens is the story of Edith Ewing Bouvier Beale (“Big Edie”) and Edith Bouvier Beale (“Little Edie”), mother and daughter, who lived together on their East Hampton estate, as their 1890s mansion they couldn’t afford to maintain deteriorated around them. Big Edie was the aunt of Jackie Bouvier Kennedy Onassis and Lee Radziwill; Little Edie was their cousin. Big Edie was sister to Jackie and Lee’s father. The two Edies became increasingly reclusive and eccentric during their time living together at Grey Gardens. They never left the property. They had their groceries delivered. By the 1970s, the house had deteriorated to a point where they didn’t have proper plumbing, heat or garbage service. The local code enforcement authorities stepped in like bulls in a china shop, did further damage to the house, and tried to remove the Edies from their home and property. The Bouvier-Onassis-Radziwill sisters sprung into action to save the Edies’ home without usurping their chosen lifestyle. In 2015, the spoof series Documentary Now!, did an eerily likable episode on Grey Gardens, with Fred Armisen playing Big Edie and Bill Hader playing Little Edie. The episode is called ‘Sandy Passage’. Definitely a fun watch. Big Edie was beautiful, spirited and talented. 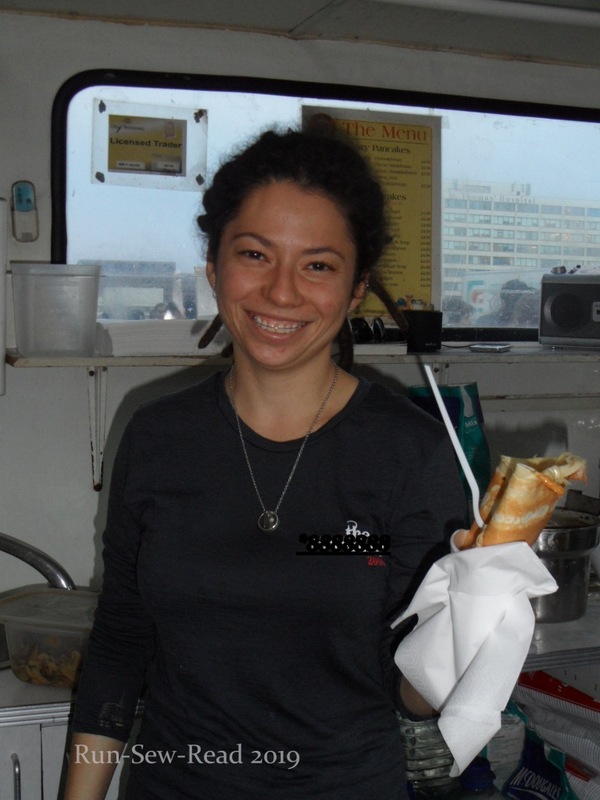 She loved singing, dancing and performing for others. Her lawyer-husband left her in 1931, when their three children were still young. Once the children were grown, he divorced and disinherited her, which left her only the Grey Gardens property and a $65,000 trust fund. Little Edie was also beautiful, spirited and talented. She spent her young adult years in New York City, but never married. At some point in her life she became bald. There are conflicting stories about how she came to be bald. To cover her baldness, she wears a variety of headscarves in the documentary, sometimes adorned with jewelry. Little Edie has so many great moments in the documentary, but this has to be my fave. Here she is, showing off her self-designed practical outfit for the day–upcycling and repurposing long before those concepts were cool. The rest of the Grey Gardens story. One is about Little Edie’s life after Grey Gardens. She left the home after her mother died in 1977, returned to the stage for awhile, and had other projects, until passing away in 2002. To say Grey Gardens is an awkward documentary to watch is an understatement. Somewhere at any given moment, viewers are easing the awkwardness by making jokes about crazy cat ladies and hoarders; and scoffing about rich people who can’t take care of themselves. But looking past the easy jokes, the story comes through about how individual all human beings are, and how each person chooses in what ways to conform, and not conform, in the community and society. I’m captivated by these stories, and so glad for Big Edie and Little Edie and the Grey Gardens documentary, and for the inspiration for creativity and delightful individualism. …is that you might not want to give the pup back. I knew it would happen to me eventually. Turns out it was foster pup #8. I’m now her permanent human. She and I have kept the name the humane society gave her–Myrtle. I never would have come up with that name on my own, but it’s adorable and fits her perfectly. When I first picked her up from the humane society, she was 4-5 months old, and had demodex, a non-contagious mangy skin condition. She was missing much of her fur. She was uncomfortable, but had a sweet disposition anyway. But the humane society clinic vets are awesome and gave us the right Rx, and in another week we started seeing gradual improvement, so that by week 3 she was really getting her fur back. This set of pictures was supposed to be for her adoption profile page. But she was already starting to win me over. She made this mess when she was about 6 months old. She is now almost 8 months, and 44 lbs, and still this serious and industrious about her play. When she is playing, it sounds like there is a basketball scrimmage going on in the room. There is a daily carpet of chewed cardboard and plastic stuff for me to sweep up. She’s a growl-talker. She talks to me all. the. time. I’m still trying to learn what she is telling me most of the time. She has an insatiable love for playing tug-of-war. A tennis ball in a sock is the best for that. Here she is with her ball & sock, telling me it’s time to play. She loves taking walks on the leash, which is less a walk than her dragging of me down the street. Once we have the leash walking routine worked out, I think she’ll be my first dog ever to be a good running buddy. Breed? She has to be part Labrador, because she has webbed paws, and she’s a water dog. I’ve already had to pull her from icy lake water. I was a terrified foster mom, and she was a cold scared puppy. That may have helped to form the bond. I think she is also part pit and/or boxer. She likes riding with me in the car, so when I reach for her Kurgo seatbelt harness, she goes wild. But once in the car she calms down and is great at riding shotgun. Because she does great at home alone, I rarely close her in the girl cave. But, I do regularly drop treats and toys in there for her to find, so she thinks of it as her ‘happy place’. So anyway, you’ll see more of Myrtle now and then. Hopefully, this doesn’t mean the end of my fostering, but it will limit the doggos I can foster. No more tiny ones, or contagious conditions. 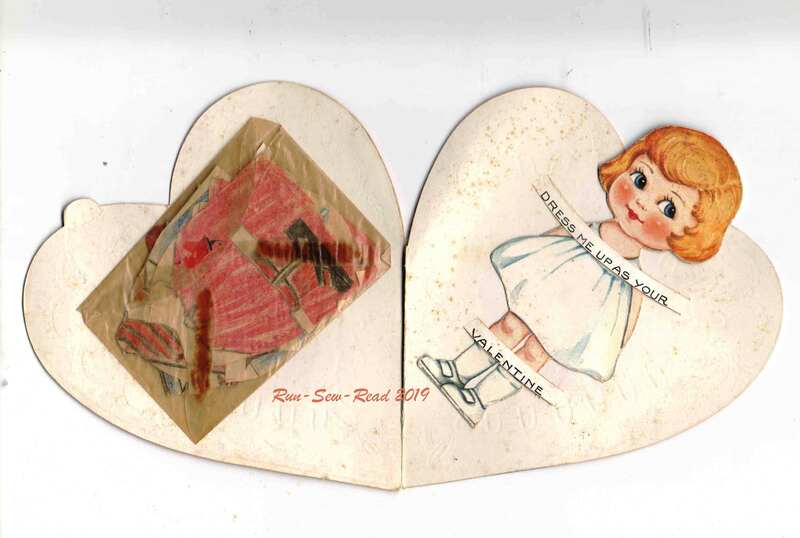 This is a Valentine card of my grandma’s from when she was a little girl in the 1920s. Not only does the envelope have the clothes that came with the card, but either the giver or my grandma made more clothes for her. 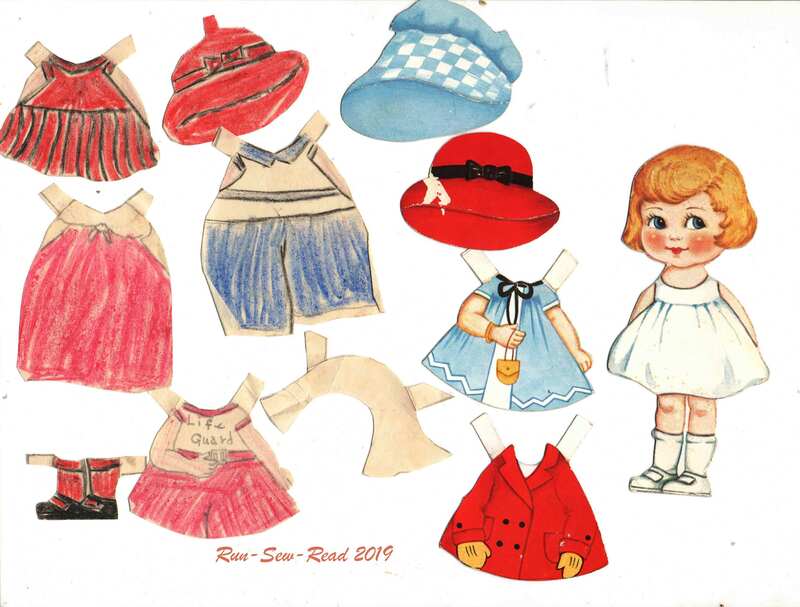 I love the hand drawn ‘Life Guard’ suit! 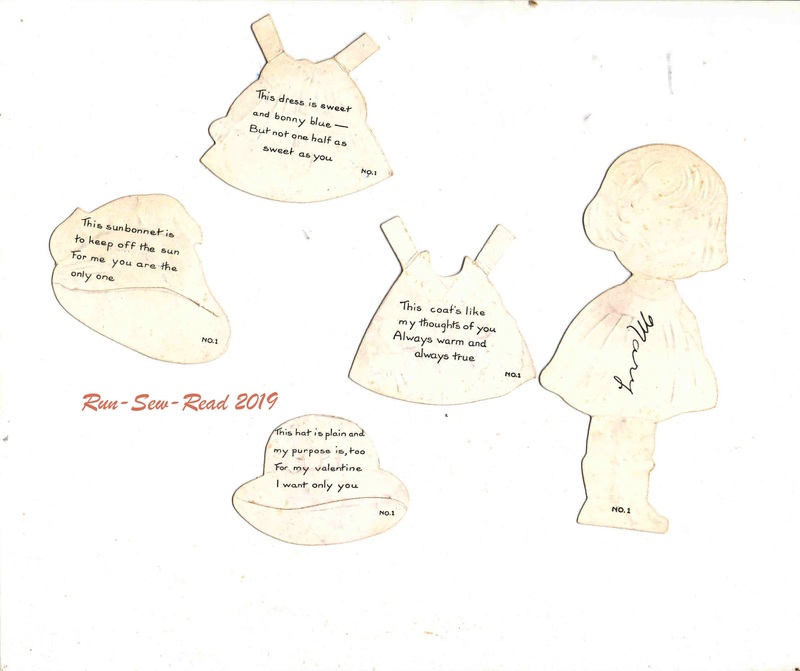 The clothes that came with the card have little notes printed on the back. 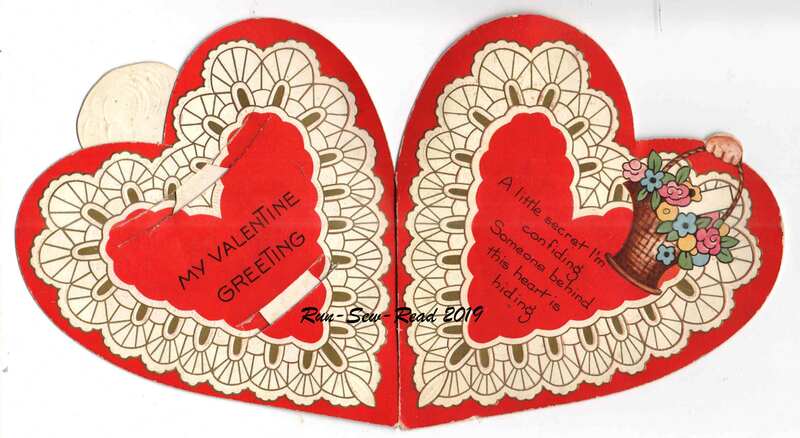 Want to print your own fun retro valentine card? Amtrak has some adorable downloadable ones! 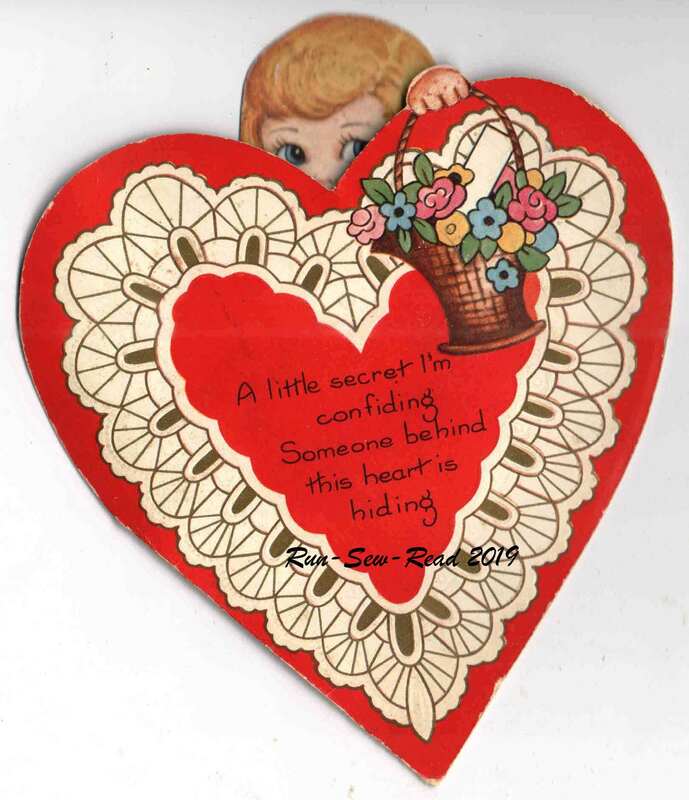 Whatever your plans for February 14th, have a lovely time! How do you pick the one best song for Valentine’s Day? I couldn’t do it. Ruling out songs I’ve previously included in posts, here are several contenders. It’s basically an entire playlist! This was the kind of Sunday afternoon that makes me start counting the weeks until Spring. A friend posted an invite this morning for an afternoon bike ride, and two of us joined her. We met at the park and took off on the bike path. After a couple of miles, we neared the grocery store, where I planned to drop the group and turn the outing into an errand. I picked up a few things from the store and then headed back home on the bike path….in the sunshine, with sunglasses on, mittens off, and coat unzipped. The crocuses haven’t even popped out in my yard yet, but I’m starting to get excited about Spring. To keep my nervous hands busy, I’ll be knitting this fun scarf. The pattern is a free download from the Lionbrand website. I’ve made this pattern once before. It makes a handy, warm scarf that stays in place. Click on the picture to go to the Lionbrand pattern download page. Here’s the SIP (‘scarf in progress’), in Lionbrand Hometown USA yarn. The color is ‘Tampa Spice’. I wanted it to be something red. The weather forecast for the game is absurdly cold. It will be single digit windchill at game time, in the outdoor stadium. In the stadium, that will feel like sub-zero temps. Hopefully everybody there will have a way to stay somewhat warm. I’ll have a cozy fire going in my room with the TV, and will make Honey-Sriracha Chicken legs in the Instant Pot and Air Fryer (stay tuned for future recipe post). Go Chiefs! (I know, I said that once already.) Enjoy the game, fellow football fans.